Whether a seasoned traveler or a casual road tripper, there can be a tendency to focus on the large things, such as flights, your suitcase, renting a car, hotel accommodations, and so on—while incidentally overlooking the smaller, less pressing things. What many people realize once the chaos has calmed and they’ve boarded their flight or arrived safely at their destination is that the trip would actually be a lot better if they had thought of such and such. Most of the time, those thoughts center around small, affordable thing. The moral of the story? It is often the little-overlooked items that can make a trip far more enjoyable. Because they’re so easy to forget, we’ve decided to put together a convenient list for you to check before your next trip. Before you leave, make sure you haven’t forgotten any of the best travel accessories under $20! 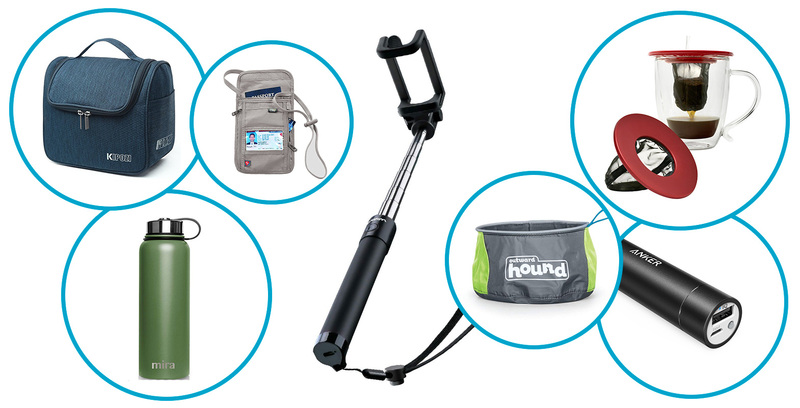 Yes, we’ve included a selfie stick on our list of the best travel accessories under $20. Yes, we’ve actually chosen to start the list with a selfie stick. No, it’s not a joke. As insidious as the selfie has become in modern society, the fact is you’ll still want to snap some pictures of yourself and your travel companions in front of the incredible sights you’ll see on your travels. There’s no shame in that! With the Mpow Selfie Stick, you can elevate your selfie game to a legendary status. It features an extendable arm and Bluetooth connectivity for remote activation of your cellphone camera. It’s lightweight, convenient, and sure to help you capture some of your best memories. To transport your shoes with ease and safety, look no farther than the waterproof YAMIU Travel Shoe Bags. They make taking your shoes with you on-the-go a breeze due to their extremely durable construction. Not only will they keep your shoes dry and secure as you travel, they’ll keep any dirt you’ve picked up while walking off of the rest of your stuff. Keeping your small electronics and accessories safe and secure while traveling can be a challenge. Cords always end up tangled, chargers manage to get lost, and cellphones somehow magically crack their own screens. Well, not anymore! The AmazonBasics Universal Travel Case for Small Electronics features a durable exterior to keep your gadgets and accessories safe while traveling. The interior has several pockets to help organize your gear and keep it secure. It’s a simple, convenient way to keep everything in one easy-to-find place! For those who travel with their canine companions, the Outward Hound Port-A-Bowl is the ideal way to keep them hydrated and well-fed no matter where you are! It is quick-drying, durable, and collapsible, making it perfect for traveling and hiking. It’s an irreplaceable accessory for anyone with a traveling pup! Traveling is no excuse for missing out on your caffeine fix. In fact, it might be the worst time to not have coffee! For delicious go-juice on-the-go, turn to the Primula Singe Serve Coffee Brew Buddy. It features a washable, reusable mesh filter and fits just about any mug. Simply place it on top of your cup, pour the grounds, and brew your perfect cup of coffee—no matter where you are! To conserve space and ensure your toothbrush stays clean on your journey, look no farther than the Travel Folding Toothbrush. The head features soft bristle for gentle cleaning and folds into the plastic handle when not in use, keeping it isolated from the rest of your toiletries. Keeping your information, money, credit cards, and identification safe while traveling is paramount. By wearing the Lewis N. Clark Neck Wallet, you not only physically protect your valuable by putting them somewhere safe and hidden, you eliminate the threat of theft by blocking RFID technology. Beyond offering security, this wallet is also incredibly durable, lightweight, and features several convenient compartments in which you can stash everything you need to carry with you! Personal hygiene is not something to neglect while traveling, but carrying all your toiletries can be bulky and inconvenient. The Gillette Venus Snap helps solve this problem. It is compact while retaining the functionality and exceptional quality of Venus Embrace blades, meaning you won’t be sacrificing comfort by opting for a travel-size razor. If your adventures involve a lot of outdoor activities or center around water, the Mpow Universal Waterproof Case is an irreplaceable accessory. Not only is it submersible, it is entirely clear and allows your smartphone’s touchscreen to function—even underwater! Imagine the peace-of-mind you’ll have when hiking through the rain or snapping pictures of sea life beneath the surface of the waves. Staying hydrated on-the-go is essential to remaining healthy and having a good time on your travels. For an incredibly durable and highly-functional bottle that can withstand abuse while keeping your beverage hot or cold for hours on end, look no farther than the MIRA Stainless Steel Water Bottle. It is insulated and sure to function at a high level for years to come. Traveling can be hard on the body, especially if you already suffer from certain ailments. The Wanderlust Compression Socks offer relief from restless leg syndrome and other discomforts that can only be accentuated by travel. They offer the perfect level of graduated medical compression and are durable enough to withstand the trials of travel. One thing we rarely lose while traveling is our phone. It’s our safety net in unfamiliar places, houses important information, and is overall a vital tool to surviving and navigating while traveling. It makes sense, then, to keep our other valuables with our phone! The Gecko Travel Tech Adhesive Phone Wallet attaches to the back of your phone, allowing you to safely store cash, cards, identification, and other small valuables. It also features RFID-blocking technology for added peace-of-mind. Keeping your electronics charged and ready-to-go is important while traveling, both for entertainment and safety. The Syncwire Fast Charging Travel Wall Charger ensures that your electronics charge quickly and safely. It’s compact, and easy-to-store. No matter where you are, you can rest assured knowing you won’t be facing the unfamiliar without your technology! Keeping your electronic devices charged on-the-go can be challenging. Finding outlets that are free to use is difficult, if not impossible. The Anker PowerCore+ Mini eliminates this problem by allowing you to charge your electronics without a wall or 12V outlet. Simply charge the lipstick-size device before you leave and it will provide an extra charge to most smartphones! One of the most compact designs on the market, the ZOMAKE Ultra Lightweight Backpack is ideal for travel of all kinds. It’s lightweight, durable, and water resistant, making it versatile for most uses. When not in use, it folds into a built-in pocket no larger than a sandwich bag—talk about portability! Utilizing the KIPOZI Hanging Toiletry Bag is sure to make your life easier as you travel about. Not only will it help you stay organized, it also provides a convenient way to access what you need no matter where you are. The multiple compartments ensure you always know exactly where your toiletries are, and the hook allows you to keep the bag off potentially dirty countertops. It’s a functional, durable, and water-resistant way to keep your sanity! Keeping everything organized while you travel is one of the greatest challenges of packing. No matter how well you fold, stack, and stuff, everything always seems to get mixed together. With the AmazonBasics Packing Cubes, this will no longer be an issue. With multiple sizes, you can pack everything appropriately and identify what you need quickly. Whether you’re filling your suitcase or adding a bit of organization to your backpack, these cubes are bound to make traveling a little easier. Traveling is a blast, but it comes hand-in-hand with plenty of worries built in – including losing or mixing up your luggage. With these inexpensive, durable, and stylish e-tag holders, you’ll never be afraid of losing your luggage on! Various packages are available (some even include ID holders) with several different colors to choose from. You know how it goes – sometimes when you travel it can be hard to get to sleep. With the all-natural Dream Water Sleep Powder, though, you’ll never struggle to get those much-needed Zzzzz’s again. Berry-flavored, natural, and non-habit forming, this drug free formula is perfect for travelers who need an extra boost of relaxation every now and then. Convenient and quick, this formula is guaranteed for fast-acting relief! Like we said earlier, travel is great, but it can be a stressful, worrisome thing, too. The Venture 4th Travel Neck Pouch Wallet helps keep your important documents safe while you’re traveling. RFID blocking, this awesome neck wallet will keep your cash and documents safe! This lightweight, comfortable, and breathable wallet helps to shield unwanted scans and provides flexible storage. Traveling conveniently is one thing, but traveling in style? That’s an extra exciting thing to implement into your travel routine. This fit and quick solution to your boring travel is the perfect gift for the travel lover in your life. Made of durable 250-gram material, this vivid, bright, and exciting suitcase cover can boost your travel routine in a snap. Double stitched all over, this is a durable, high elasticity, and convenient cover that can protect your luggage, keep your items safe, and provide a boost of vivid excitement to your travel plans! Travel lovers know that every hotel, hostel, and Air BNB shower situation is different, which means that every shampoo and conditioner situation is different, too. These reusable, universal, and convenient pumps are perfect for shampoo, conditioners, and bodywashes no matter where you are or what bottles are in your place! If you’re a clean-freak and don’t want to deal with other people’s germs, this is the perfect solution — bring your own pumps with you to stay clean, hygienic, and germ-free! If your travel bug is tired of carting around plastic bottles, consider the Sally’s Organic Empty Amber Glass Spray Bottles. These 16 oz bottles are BPA and lead free, can be used time and time again, and have a great, reliable design. Not only are they guaranteed for life, they’re conveniently equipped caps and labels to help you keep your bottles straight. Travelers don’t have to sacrifice good smell just because they’re on the move – these mini refillable perfume atomizer spray bottles are tiny enough to carry onto airplanes, compact, and totally reusable! Each set comes with 5 individual bottles with clear sections to see how much perfume or cologne remains! Simple and convenient, you can take your perfume along with you without taking the whole bottle with you. Essential oils are the new craze, but if you’re constantly on the go, it can be hard to jump on the bandwagon with a bunch of oil containers. With essential oil roller bottles, you can bring them along with you. Tiny enough for a carry-on and equipped with stainless reel balls, the essential oil rollers are corrosion resistance and well-made enough to prevent leakage – perfect, worry-free additions for your suitcase!